On Taxon of the Day and in compiling the Catalogue of Life we appreciate a monotypic taxon because it allows us to move on to something else tomorrow having some sense of completion. We also enjoy a good name whether it be scientific or common. Calypso bulbosa (L.) Oakes or Venus's slipper fits the bill on both accounts, seductive name, taxonomically unique. The only species in the genus Calypso in the family Orchidaceae, this plant is a perennial that grows from a round, bulb-like corm (hence bulbosa) 10-20 cm tall with a fragrant, white to pink to purple, solitary flower head. The lip of the orchid is pouch-like (hence slipper) and each plant has a single basal, oval leaf. The distribution is circumpolar so you can find it typically in the northern coniferous forested regions of Northern Europe, Russia, Japan, US and Canada. Due to having a mycorrhizal dependence on fungi it is almost impossible to transplant or grow outside of its natural environment. The etymology comes from Greek mythology where Calypso was a sea nymph in Homer's Odyssey, noted for her beauty and secretive behavior which is perfectly descriptive as it is known to favour the forest understory or similarly sheltered place. Thus finding one can prove quite difficult but when it happens it's memorable. For example in 1864 on meeting the Calypso after a long day of botanising the naturalist John Muir remarked - "It seemed the most spiritual of all the flower people I had ever met. I sat down beside it and fairly cried for joy." 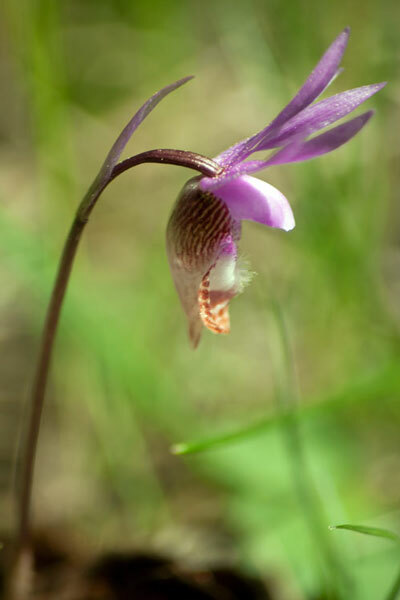 A full description of Muir's meeting with Calypso bulbosa (then known as Calypso borealis) can be found here. The Catalogue of Life lists four varieties of Calypso bulbosa all differing slightly in their appearance and distribution. @ Catalogue of Life 2013. Simple theme. Powered by Blogger.